If you haven't figured out your Halloween costume, don't fret! Morton Salt is incentivizing you to dress up as the Morton Salt Girl. Why waste hours trying to come up with an original idea when you have the chance to win a thousand smackeroos? And you don't even have to be young and female. In fact, you can be not-so-young and male! Read more about the sweepstakes at MortonCostumeContest.com. 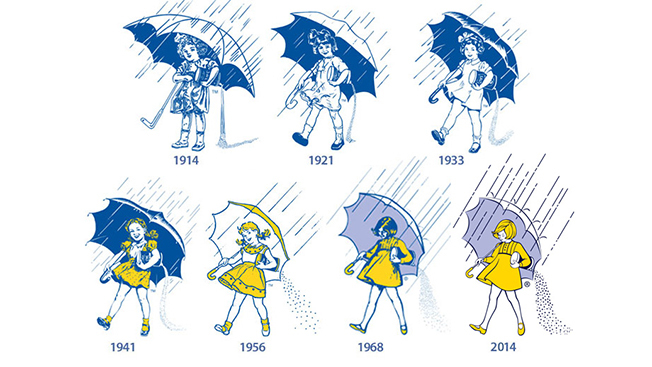 The Morton Salt Girl certainly is iconic. She began her reign (sorry) in 1914 with some print ads from N.W. Ayer & Company in Good Housekeeping with the tagline, "When it rains it pours." Initially, the slogan was a hat-tip to Morton Salt's major product innovation at the time: The salt still flowed freely in damp weather. She has gotten a few makeovers over the years, but she's still kicking around 100 years later. Though wouldn't it be awesome to see the girl—she's supposed to be 8 years old—aged to 100 (or 108) on a few of the centennial celebration bottles? The brand has boosted its presence on various social media platforms this year for the centennial celebration. But it still doesn't post all that often. As part of this year's celebrations, the brand wanted to show consumers how many different ways their lives are impacted by Morton Salt and the Morton Salt Girl. It's a cute and informative message (there are more ways than you'd think). But the tagline, "She's still the one," might be a little too romantic if you think about it. Founded in Chicago in 1848, when that city's population was just 20,000, the company is more than 160 years old. In 1886, Joy Morton renamed the company, which had been called Richmond & Company, Agents for Onondaga Salt, to Joy Morton & Company. It wasn't until 1910 that it became the Morton Salt Company. In 1911, the company added magnesium carbonate to its salt. At the time, that's what allowed the salt to flow freely. Now the company uses calcium silicate to achieve the same thing.